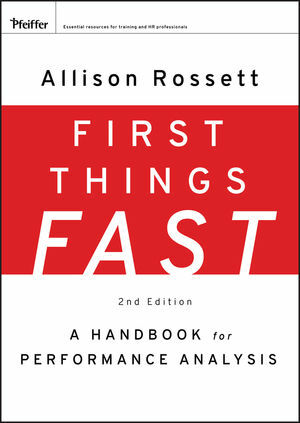 THE WORLD OF LEARNING AND PERFORMANCE has changed significantly since the first edition of First Things Fast was published more than a decade ago. This thoroughly revised and updated second edition of the best-selling classic recognizes a world chock-full of technology, economic strains, and opportunities. How do learning and performance professionals plan in this shifting context? How do they take advantage of new human and Internet-based resources? How do they bring their recommendations forward and add more value, no matter where they work? These questions are addressed throughout this new edition. This important resource is a practical guide that is filled with job aids, design templates, and examples offering step-by-step guidance to the basics of performance analysis. "Allison Rossett combines thought leadership for the profession with practical guidance. This book, the second edition of a classic in the field, is filled with proven practices and ready-to-use tools making this a resource you'll use frequently." "What I appreciate about this book is that it is a straightforward, practical guide to planning, and it embraces new technology and the convergence of learning and work." Allison Rossett is a professor of educational technology at San Diego State University and a consultant in workforce learning and performance and technology-based systems. She is the author of the best-selling Handbook of Job Aids (Pfeiffer) and Beyond the Podium (Pfeiffer), both of which are winners of the International Society for Performance Improvement's Instructional Communications award.